ON THIS DATE (April 29, 1986) ... In one of the most sensational pitching performances in baseball history, Red Sox right-hander Roger Clemens struck out a major league record 20 batters en route to a three-hit, 3-1 victory over the Seattle Mariners. In 111 years of major league baseball, Clemens is the first pitcher to strike out 20 batters in a nine- inning game. He walked none. Watching the Mariners try to hit Clemens was like watching a stack of waste paper diving into a shredder. Slumping Seattle is on a record-setting strikeout pace, and Clemens was at the top of his high-octane game. No one could have envisioned the magnitude of Clemens' mound mastery. Roger struck out the side three times. The Mariners put only 10 balls in play. Seattle pulled only two balls all night. He threw 138 pitches, 97 for strikes. 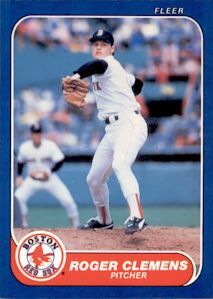 Clemens tied a league record with eight straight punch-outs, broke the single-game Red Sox strikeout record (17 by Bill Monbouquette in 1961) and shattered the Fenway Park mark (16 by Jack Harshman of the White Sox in 1954). Dwight Evans' three-run, two-out, seventh-inning homer supplied the punch for the victory, but this was not a night to talk about hitters. The major league record for strikeouts in a nine-inning game had been 19, accomplished by Steve Carlton, Tom Seaver, Nolan Ryan and Charles Sweeney (in 1884 while pitching for Providence of the National League). Clemens broke it in the ninth. The overall record is 21 by the Washington Senators' Tom Chaney against the Baltimore Orioles in a 16-inning game Sept. 12, 1962. In the middle of the game, Clemens joined Ryan and Ron Davis as the only American Leaguers to strike out eight consecutive batters (Seaver holds the major league record with 10). Boston's 23-year- old phenom made history in the fourth, fifth and sixth. He fanned eight straight Mariners, four swinging, four called. Owen broke the string with a two-out fly to center in the sixth. The fireballing righty was the last thing the Mariners needed to see. They came into the game with 166 strikeouts, 55 more than the league runners-up (Texas, 111). Seattle is on a pace which would shatter the major league strikout record (1,203) by more than 200. Clemens was perfect in the first three innings. Owen, Bradley and Ken Phelps all went down swinging in the first. Gorman Thomas led off the second with a hard liner to Jim Rice in left, then Jim Presley and Ivan Calderon (called) struck out. In the third, rookie Danny Tartabull grounded to second, Dave Henderson was called out on strikes and Steve Yeager flied to left. Clemens was in danger of walking five of the first nine batters, but never threw ball four. Clemens no-hitter/perfect game was punctured in the fourth when Seattle shortstop Owen led off with a single to right on an 0-2 curve ball. Clemens punished the Mariners by whiffing the next six batters. He got Bradley and Phelps swinging, then watched Don Baylor (playing first while Bill Buckner DH'd) drop a Thomas popup in foul territory. Baylor's blunder served history well. Thomas was called out by Vic Voltaggio on a 3-2 pitch as Clemens closed the door on the fourth. Clemens brought more high octane to the hill in the fifth. He fanned Presley with a 2-2 heater, then blew Calderon away on three pitches (the third was called). Tartabull worked the count to 2-2 before looking at strike three. Clemens had 12 strikeouts at the end of five. With an assist from Baylor, Clemens had become the third pitcher in Sox history to fan six straight batters. The immortal Buck O'Brien turned the trick against the Senators on April 25, 1913 and Ray Culp punched out six straight Angels on May 11, 1970. O'Brien and Culp fell out of the Sox record book when Henderson fanned on a 2-2 pitch leading off the sixth. Seven straight. Yeager was next and fell behind 0-2, then looked at a 2-2 curve ball. Eight straight. Owen broke the string by flying to center to end the sixth. Through six innings, Clemens had fanned 14 and thrown 92 pitches, 60 for strikes. The Mariners had put only four balls into play. The fires were still burning in the seventh. Bradley and Phelps struck out swinging. With the count 1-2 on Thomas, the crowd was on its feet and roaring. And then it happened. A long fly to deep center landed in the first row of the center-field bleachers. Clemens trailed, 1-0. Evans got it back, with interest, in the bottom of the seventh. With two outs and no one on, Steve Lyons slapped a single to left off Seattle starter Mike Moore. Glenn Hoffman walked (Ed Romero ran for Hoffman), then Evans drove a 1-0 pitch off the back wall in center for a 3-1 lead. He picked up strikeouts No. 17 and 18 in the eighth. He saved the best for last. In the ninth, Clemens struck out Spike Owen swinging, then fanned Phil Bradley on three pitches for the magic No. 20. Ken Phelps grounded to short to end it.